The OData team and Business Platform Customer Experience team hosted an OData Meetup in March — a free event that gave the OData community a chance to get together and discuss the latest developments in the OData ecosystem to help ensure greater interoperability among implementations. 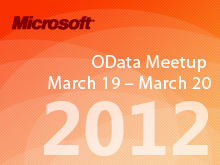 At the event, attendees had the opportunity to attend presentations by OData subject matter experts covering topics related to the OData protocol and its roadmap. Attendees also participated in one-on-one discussions with other producers and consumers who have implemented OData.